During the past week we’ve been subjected to hours of testimony by or interviews with James Clapper, former Director of National Intelligence. On Sunday, Clapper made waves when he said on CNN that Donald Trump is engaged in an assault on US institutions by doing things like firing the head of the CIA and challenging the separation of powers between the executive and the legislative. We can agree with that sentiment without agreeing that Clapper can be the poster boy for upholding the integrity of US institutions. Clapper is a former head of the Army’s Defense Intelligence Agency and for 7 years, 2010-2017, he headed up Barack Obama’s NI, which oversees the 17 intelligence agencies including the shadowy NSA. Clapper massively undermined the 4th Amendment of the Constitution with bulk warrantless surveillance of the US public. It was the malpractice of the NSA under Clapper that drove otherwise good soldier Edward Snowden to risk life and liberty to blow the whistle. Clapper’s NSA was collecting location data on 5 billion cell phones around the world, including those of some Americans. The NSA also used dirty tricks to weaken encryption standards, the kind of thing that led directly to the massive ransomware hacks that hit hospitals and other key institutions this weekend. That attack hit Microsoft. Apple has better encryption, but Clapper’s friend Jim Comey tried to weaken privacy on all Apple devices to solve one mass killing (there are hundreds of those a year). Apparently no one told Obama what the NSA was up to for the first year or year and a half of his presidency. Talk about Deep State! Frontline reported that he finally got read in, in 2010. I suppose it must have been Clapper who deigned to let the Commander in Chief know that the NSA had unilaterally suspended the constitution and was rifling through the private papers and effects of millions of people. It is one of the things about the Obama presidency about which future historians will judge him negatively, that he just nodded and let Clapper carry on. 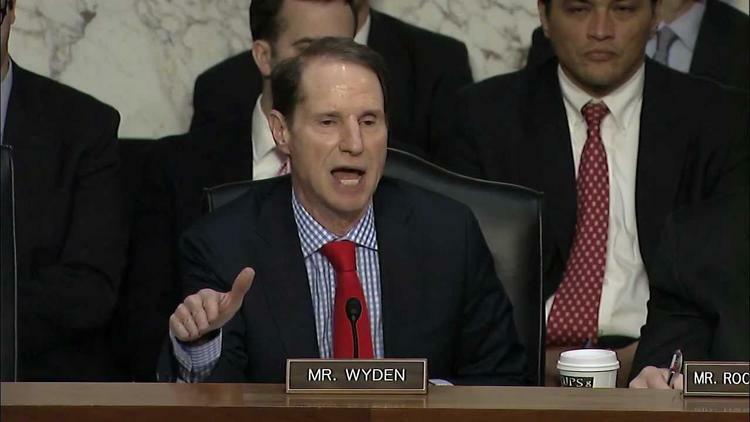 Senator Ron Wyden knew what Clapper and other US security agencies were up to, but could not speak out for fear of being arrested. He hinted around as broadly as he could that a provision in the highly unpatriotic USA PATRIOT Act was being misused for mass spying on us. What kind of tinpot dictatorship do we live in where a sitting senator can know of executive branch crimes against the constitution, and be afraid to speak about it on the floor of the senate? Clapper testified under oath before Congress about these issues and was directly asked if he was surveilling us. Lying under oath was actually the charge on which Bill Clinton was impeached by the lower house (and I do mean lower). Clapper also wanted to violate the first amendment of the constitution (having more or less abolished the 4th amendment) by jailing reporters who covered the Snowden revelations! Clapper skated. I don’t know if, like J. Edgar Hoover, he just has fat files on the foibles of Washington heavyweights or what. For some reason he was teflon. So, Clapper cannot be the poster boy for objections to Trump acting high-handedly. We have to find someone with integrity to idolize as a Trump critic if we are actually going to dig out of this hole. *An earlier version of this essay misidentified Mr. Clapper as having been head of the NSA.